Zenith has developed a Premium range of compound Excel, Ultimex, Super Rock & Ultra Super Rockwhich has superior release characteristics and dimenional stability. Resistance to chemical & steam environment. Thermal stability & Operates at high pressure. The compound is Designed to withstand Nip Load upto 500 kg per Linear cm. The below chart is a glimpse of the newly developed superior compound. ULTIMEX 250 92-95 10 TO 15 Blind Drill Roll,Suction Press Roll,Bottom Press Roll, Touch Roll Good wear & chemical resistance, provides long running time. Drilling provides longer nip dwell time. Premium bonding system for long service. Homogenious composition provides excellent moisture profile. Excellent resilience for optimal lip performance. EXCEL 400 95-96 10 TO 15 High Speed, High Nip Load - Blind Drill Roll, Suction Roll, Film Press Roll, Nippco Roll. Good wear & chemical resistance, provides extra long running time. Drilling provides longer nip dwell time. Premium bonding system for long service. Homogenious composition provides excellent moisture profile. 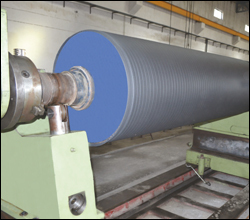 ULTRA FLEX COATING 88-92 25 TO 30 Film Press Roll Superior wear resistance at high speed, minimal after hardening for stable process, excellent runnability & economical solution coating. CRYSTAL COATING 88-90 25 TO 30 Film Press Roll Good wear & wad resistance, provides long run, resistance to sizing chemicals, excellent water resistance (hydrophobic). Very good runnability. SUPER DIAMOND COATING 84-85 _ Top Press Roll Premium compound with superior release characteristics and dimensional stability. Resistance to chemical & steam environment. Thermal stability & Operates at high PSI. SUPER ROCK COATING 84-86 _ Top Press Roll Excellent weart resistance, easy sheet release properties and good doctorability. 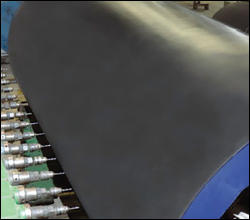 ULTRA SUPER ROCK COATING 85-87 _ Centre Press Roll Hard rubber coating which provides stable runnability & superior sheet properties. Effective doctoring at such demanding positions as bi-nip rolls. Superior chemical resistance & maintains hardness at high temperature. Dri-Press is a modern technology product, which ensures premium quality paper and increased production. Cost-effective due to its improved runnability, energy savings and increased production. We have Voith making drilling machine capable to drill Suctions roller dri-press & dri-press (B.D.R) efficient of drilling one roller within 12 Hours. To make maximum use of your Dri-Press. Zenith Rubber introduces the Dri-Press to provide more efficient water removal than other venting techniques. We have the facility of both balancing the Dynamic & static. 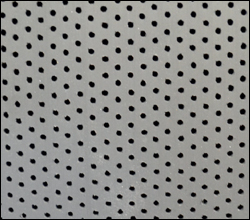 Many ultra modern tests like Ultra Sound, Radiography for these minor invisible cracks are conducted before each core is passed on to avoid big problems at a later stage. The C.I. hub, fabricated Steel hub are bored and machine shaft are Shrunk, Fitted into the hubs with precision. The Hubs are shrunk & power pressed into the pipe. The Spindles are machined & dynamically balanced. 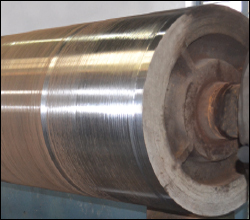 We grind all types of rolls to exact application, specification and surface finish as required by the application of roll in RA value and measure results with state of the art equipment. 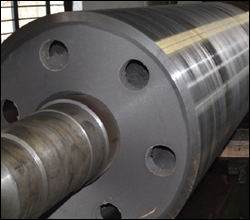 We have 20 years of experience in grinding of different type of rollers, size & materials. We have latest high precision Roll Grinding Machine (German Herkules, Waldrich & Dronsfield) with precision measuring instruments (Base metal hardness, Roll clipper & RA meter micrometer 0 to 1900) well approved support system. For support & very expert operators, make us to deliver jobs with geometrical accuracies. 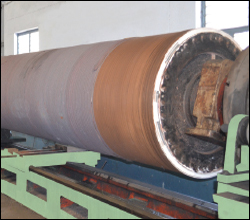 Our capability of grinding of Roll. In addition to the standard inspection, repair and replacement procedures, a complete line of services are available to ensure that the roll returns to the millgood-to-go and in the shortest possible time. 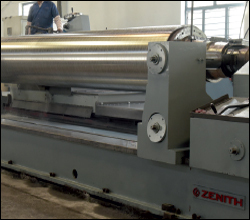 Zenith Roller continually invests in the latest mechanical services, technologies and ongoing training of shop personnel ensures excellent quality on every roll. 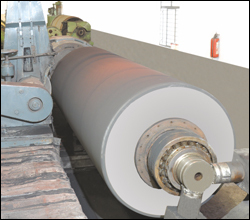 Zenith Roller services roll covers beyond the new recover by providing regrinding, regrooving and inspection services on all rolls. Drill cleaning can clear severely plugged shells when water blasting and chemical cleaning cannot. Using the same drill machine used for drilling covers, complete cleaning can be accomplished in a relatively shorter amount of time. Using local, reputable NDT service companies, Zenith plant can perform necessary non-destructive testing on all roll components. The official findings are included with Zenith Roller's final inspection and rebuild report. 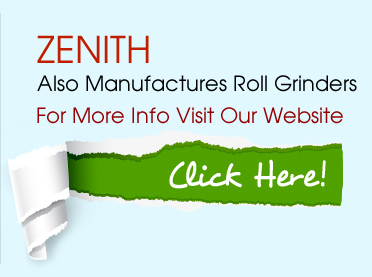 Often needed on short notice, Zenith Roller supplies dummy heads engineered and designed for every roll in the industry with little or no delay to the processing of the roll. Heads can be returned with the roll or kept at the local Zenith Roller plant. Zenith Roller uses ultrasound inspection to identify the problems with the roll covers that may not be detected using other techniques. Trained technicians using specialized UT equipment can help detect voids, separations and cover looseness. From minor blemishes to major damage, Zenith Roller's trained technicians and ASEs help to salvage and maximize cover life. Evaluated for viability and cost on a case-by-case basis, assistance with repairs are performed on-site or the rolls are sent to a Zenith plant for extensive repairs. Available on-site or at one of the Zenith Roller's strategically located plants, training seminars are structured to meet the specific needs of the customer. Topics range from roll rebuilding fundamentals and procedures specific to certain roll types, to general topics such as grinding, balancing, roll handling and storage.